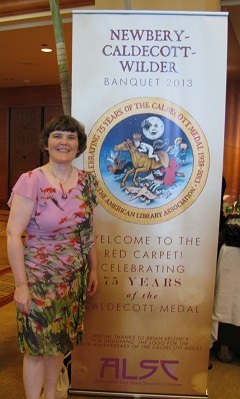 ALA 2013 – Newbery/Caldecott/Wilder Banquet! 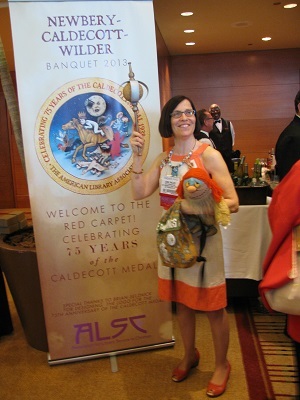 Sunday night – Time for the Newbery-Caldecott-Wilder Banquet! 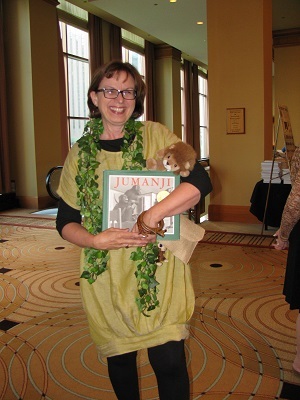 This year, ALSC was celebrating the 75th anniversary of the Caldecott Medal, so they had encouraged people to come in costume. I simply added a bell around my neck. If you could hear it, you still had the magic. 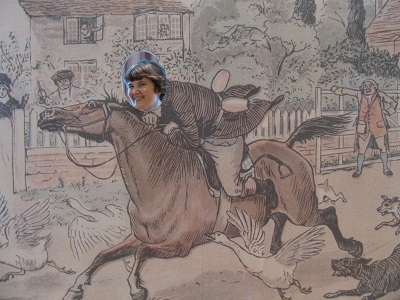 The backdrop for the above photo is from the illustration created by Randolph Caldecott on which the front of the medal is based. I tried to take pictures of many people I saw in costume, but I didn’t write down all the names. If you know someone in a picture, let me know who it is in the comments! 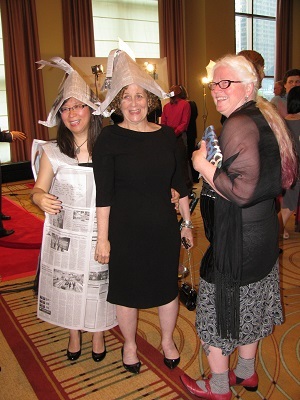 Then I got a picture of Monica with Roxanne Feldman, who was in a full newspaper costume. They go all the way around! 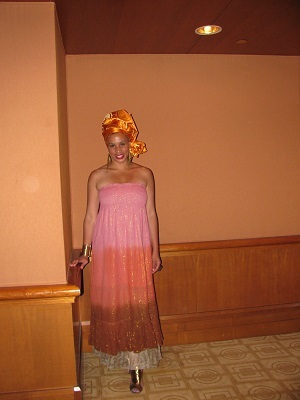 Here’s Mary Ann Scheuer as an exquisite Olivia. 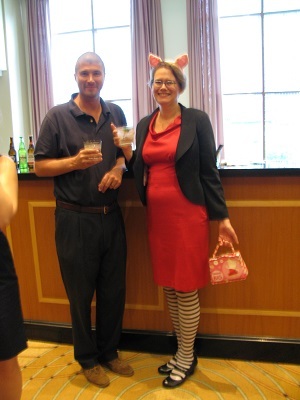 I believe she’s with Kelly Celia (from Walden Pond Press)’s husband. I think his name is Eric. He’s a teacher, and was a nice addition to the children’s book crowd. 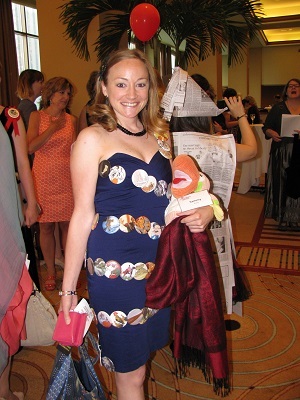 Here’s Chelsea Couillard-Smith with cutouts from Lois Ehlert’s Color Zoo! Paul Zelinsky is again wearing his so-appropriate Rapunzel tie. 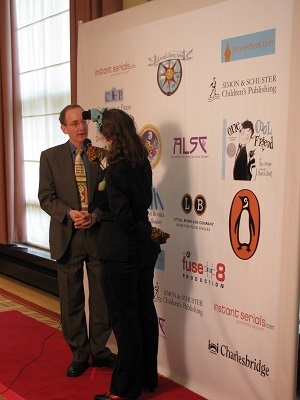 He’s being interviewed by Betsy Bird, who explained her complete Caldecott medal-and-honors honoring costume on her own blog. Finally, the speeches! 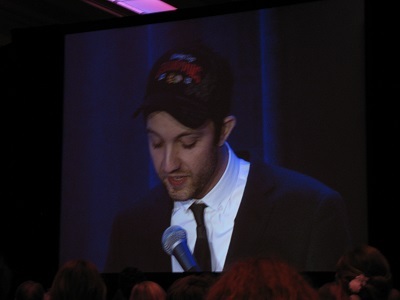 Here’s Jon Klassen giving his acceptance speech for the Caldecott Medal for This Is Not My Hat. 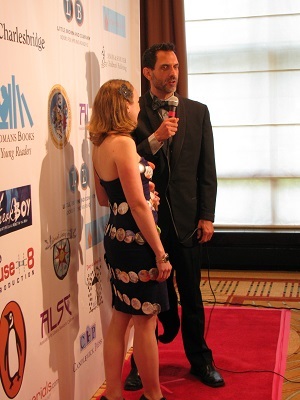 I found most of the pictures I took of Honor winners were blurry or a little bit boring. 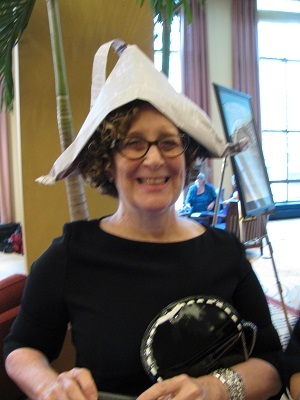 But isn’t this picture cute of Laura Amy Schlitz accepting her Honor award from the Newbery Chair? I love the twinkle in her eyes! 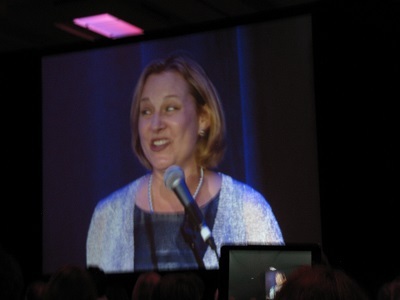 Then came Katherine Applegate with her Newbery Acceptance Speech. 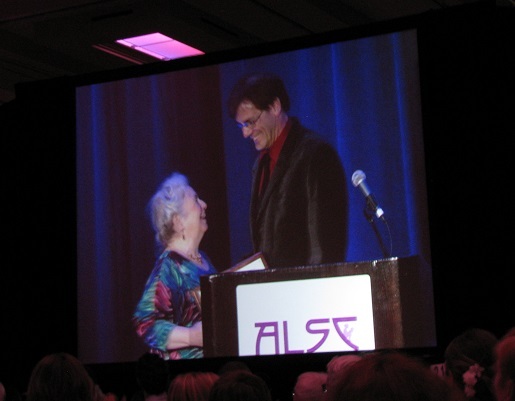 Finally, Katherine Paterson accepted the Laura Ingalls Wilder Award for lifetime achievement. She moves a lot when she talks, and I was not able to get an unblurry picture of her. 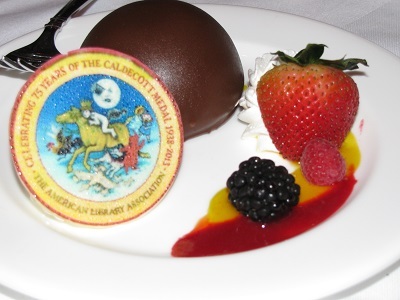 It was a marvelous evening, and the committee who put together the 75th anniversary activities can congratulate themselves for a job well-done! This is my sixth ALA2013 post. 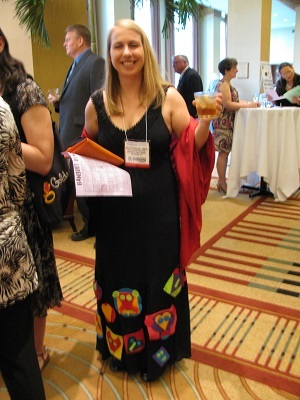 Still to come are Monday’s programs and then the Printz Awards Reception. So much good stuff spinning in my mind!